The holiday home Pescatore, suited for six people in Riva di Solto, lies in the province Bergamo (Lombardia) in Italy. It is on the second floor of the house. In addition to the cosy furnishings, the living room is also equipped with a satellite TV. The kitchen features an oven and dishwasher. One of the bedrooms has a double bed. Each of the two other bedrooms has a single bed. A crib can be added upon request. The bathroom features a shower, toilet, bidet and sink. Central heating and a washing machine are standard fixtures. A garden, which is also available to other guests, and garden furniture are at your disposal. Bergamo, situated on the western shores of Lago d'Iseo (lake Iseo), is only 38 kilometres from Riva di Solto. 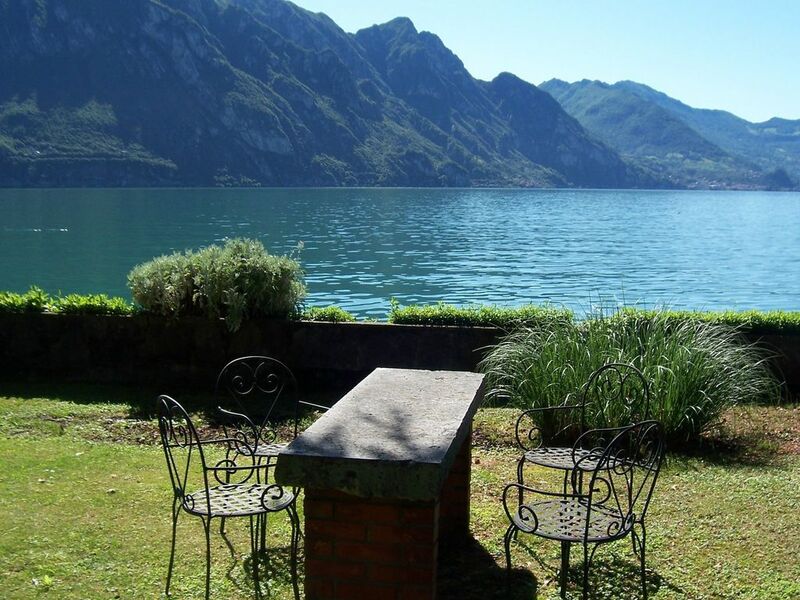 Lago d'Iseo is located in the Bergamo Alps and northwest of Brescia (20 km away). Milan is 80 kilometres away. This is a very spacious apartment, in a very small lake front village, with great views over the lake from the living room windows. The bedrooms are very big and the two bathrooms well equipped, though the one shower stall is on the small side and no keys or locks are available to guard your privacy in the bathrooms. The kitchen is very functional. The outstanding feature of this apartment is the amazing garden, situated 100 meters from the house, which is right on the waterfront. It is incredible to have such a great space, with perfect views of Monte Isola and the great rock faces of Trenti Passi. You can sit there for hours just enjoying the view, having a lunch or dinner, with a take away pizza preferably of the usual fantastic quality in Italy. The village is very small and has little to offer, some very picturesque medieval streets, three restaurants, a bar and two small shops, but in return it is very quiet, which is also nice. We greatly enjoyed our stay and in the hot weather we swam a lot in the lake, which not many others did. Die Wohnung ist sehr schön und gut ausgestattet. Zudem ausgesprochen freundliche und umsichtige Verwalterin! Een heerlijke vakantie gehad. We kregen het apartement op de 3e verdieping en niet die op de 2e. Maar het was een prima appartement met prachtig uitzicht. Het café onder de appartementen is gezellig, lekker eten en drinken maar.... erg luidruchtig. Het ging tot in de nacht door en om 7 uur s morgens was het alweer open. Maar al met al is Riva di Solto een erg leuk dorpje en het appartement een mooi stekje! Mooi appartement, direct aan het meer. Prachtig uitzicht. Heel ruim en compleet wat betreft inrichting. De tuin ligt aan de andere kant van de straat en is ook ruim. Jammer is dat je niet direct vanuit de tuin het meer in kunt om te zwemmen. Das Haus liegt direkt am See, zum Garten muss man leider über die Strasse. Alle Einkaufsmöglichkeiten liegen in der Nähe. Ruhig, schön zum Wandern oder Radfahren. Insgesamt gut.